Lesson 3 in Paul Krugman's Masterclass is 7 minutes and 40 seconds long. It is 1 minute and 51 seconds shorter than Lesson 2 but on a theoretical level much greater damage is done than in yesterday's lesson. In this lesson, Krugman introduces Ricardo's rent theory as a foundation of economics. This is a disastrous start. cost of producing corn and hence the price of corn keep rising over time. margin, and therefore without any impact on costs. earn some positive rent, however small. Turgot and rediscovered by the neoclassicals - simply does not apply. Then Krugman goes completely off the rails by his telling of the "Parable of the Baby-Sitting Co-Op". Twenty years ago I read a story that changed my life. I think about that story often; it helps me to stay calm in the face of crisis, to remain hopeful in times of depression, and to resist the pull of fatalism and pessimism. The Capitol Hill co-op adopted one fairly natural solution. It issued scrip--pieces of paper equivalent to one hour of baby-sitting time. Baby sitters would receive the appropriate number of coupons directly from the baby sittees. This made the system self-enforcing: Over time, each couple would automatically do as much baby-sitting as it received in return. As long as the people were reliable--and these young professionals certainly were--what could go wrong? It is important to understand what is going on here. In a moment Krugman is going to liken this babysitter co-op to the economy. But this is far from the case of what the co-op is, on any scale. In actuality, what is going on here is barter. You watch my kids, I'll watch your kids, with scrip inserted to make sure there is a balance between watching and leaving off. So the first important thing to understand is that in Krugman's little world there is no money! Money is a medium of exchange you use in nearly all daily transactions, not a piece of script that can only be used for babysitting purposes. So he is trying to justify the printing of money using a model where there is no money! Well, it turned out that there was a small technical problem. Think about the coupon holdings of a typical couple. During periods when it had few occasions to go out, a couple would probably try to build up a reserve--then run that reserve down when the occasions arose. There would be an averaging out of these demands. One couple would be going out when another was staying at home. But since many couples would be holding reserves of coupons at any given time, the co-op needed to have a fairly large amount of scrip in circulation. Now what happened in the Sweeneys' co-op was that, for complicated reasons involving the collection and use of dues (paid in scrip), the number of coupons in circulation became quite low. As a result, most couples were anxious to add to their reserves by baby-sitting, reluctant to run them down by going out. But one couple's decision to go out was another's chance to baby-sit; so it became difficult to earn coupons. Knowing this, couples became even more reluctant to use their reserves except on special occasions, reducing baby-sitting opportunities still further. First, let's consider this "small technical problem". Krugman doesn't go into details, but for some reason there is an obvious taking away of script from some of the participants. The dues sound like some kind of a tax. The rational conclusion would be, "Hey taxes are bad, they are taking from some and giving to others. If you do it at a high enough rate, you are going to collapse the system". The script system, because of these tax/dues, appears to have pretty much collapsed the co-op. But what is cute is that Krugman doesn't call this tax/dues caused collapse a tax/dues caused collapse, he calls it a recession. It's Krugman getting really mentally disorderly. These scripts, I emphasize again, are barter tools, not money. The scripts do not have an exchange ratio against all products the way money does, i.e. money is about prices. The scripts simply reflect a call on babysitting services. That's it. A recession is about changing prices. The stock market collapses in a recession, housing prices collapse, prices are too high for some products, causing fewer sales resulting in businesses laying off employees and sometimes failing. How is any of this action reflected in Krugman's babysitting story? The answer is that it is not. Yet, Krugman plows along with his model and says that the issuing of more calls on babysitting services is like printing money. But, it is an entirely different thing. If the money supply somehow dropped, prices would adjust downward so that the economy could function. 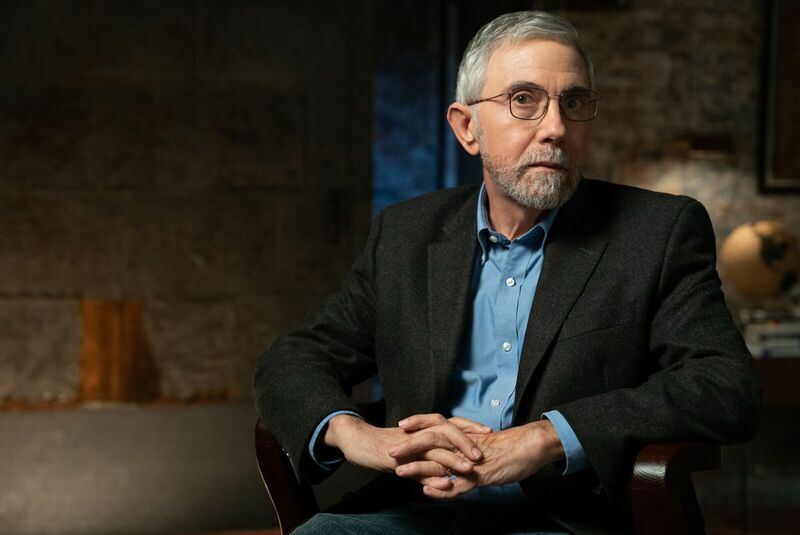 In Krugman's model with script, when the script declines because of dues/taxes, there is no mechanism to adjust the economy, because we are not talking about an economy or a medium of exchange, we are talking only about a script good for one hour of babysitting. Print more calls for babysitting services and, duh, you will get more demand for babysitting services. If you print more money, prices adjust through out the economy having only distorting impact on the economy that favors those who get the new money first. Bottom line: Krugman's babysitting model is so poorly constructed and has so little to do with the real economy that one has to think that it's easy to understate the depth of his incomprehension. Sorry, Mr. Wenzel, but despite your poor opinion of Krugman, he is a genius! From your post today, it appears that Krugman is reading aloud old columns of his, and charging people $90 to watch him do it. Probably more lucrative than doing an audio book -- "markets in everything" etc. etc. Indeed. The genius of Krugman is being paid so well for so little of value.